How will you face the many challenges of retirement? Know that your basic needs are covered by using the Retirement Income Illustrator tool. 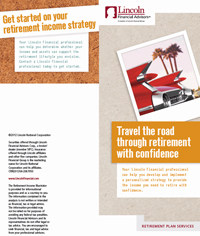 Retirement Income Illustrator is an income needs gathering and planning tool available through your financial advisor. It is designed to allow you to get beyond the point of worrying about the unknown of retirement to knowing that your basic needs are covered and focus on enjoying the next stage of your life. To read about this system, click on the image below. To view a short video about this system, click here.